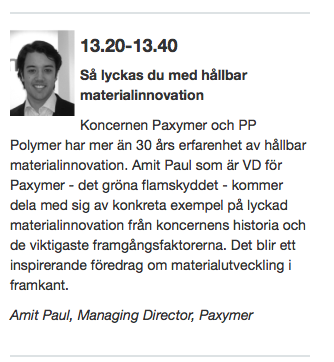 The innovative company will give its lecture on ”Successful sustainable product development” at 1:20 pm on the innovation stage on the first day of the fair in Malmö, Sweden. Paxymer AB was spawn out of PP Poylmer AB a company with more than 30 years of sustainable product development experience. PP Polymer have developed a number of products within polymer chemistry. An electrically insulating epoxy resins for hydro power plants, one of the first led free stabilizers for PVC and adhesives for Kodak and the Paxymer halogen-free flame retardant system among other products. Managing director Amit Paul will delve into the vast experience of the Group and share a simple toolkit for successful sustainable product development. 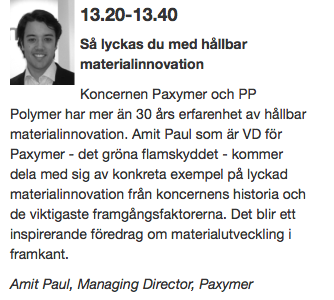 Amit Paul gives his lecture at 1.20 at the innovation stage at Plastteknik. Paxymer is also exhibiting with its distribution partner IMCD Nordic in booth E18. Welcome!